When it comes to stacking meat-upon-meat, pretty much nothing surprises us these days. So a hot dog on a hamburger? Pretty much inevitable (see: bacon on hamburgers). Adding potato chips? Sure, why not get it all done with at once. 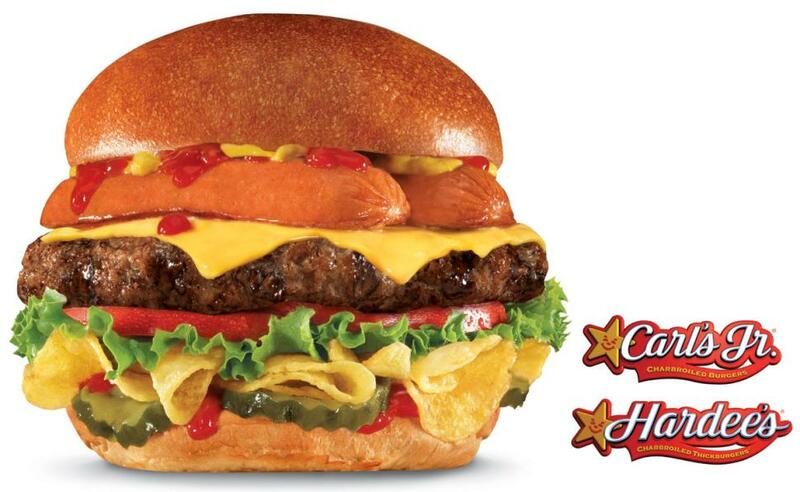 That’s the lineup for the Carl’s Jr./Hardee’s upcoming Most American Thickburger. Along with the meat and Lay’s chips will be ketchup, mustard, tomato, red onion, pickles and American cheese, reports the Associated Press, with the whole thing weighing in at 1,030 calories and 64 grams of fat. It goes on sale for $5.79 alone or $8.29 for a combo at both restaurants starting May 20. “The hot dog is like a smoked meat product, so it’s not unlike bacon,” Brad Haley, chief marketing officer of CKE Restaurants, the owner of Carl’s Jr. and Hardee’s told the Associated Press. “We’ve had this idea, believe it or not, for a long time,” Haley said. We do believe, you, Brad. Because America does seem to go for meat overdoses — remember the Arby’s Meat Mountain? The Most American Thickburger will be joining Thickburger siblings that have come before it, including the Philly Cheesesteak Thickburger and the Texas BBQ Thickburger. Carl’s Jr. Is Begging Amazon To Bring It Into The Family – But Is The Chain Serious?